By Ted Caddell and Rich Heidorn Jr.
Ohio electricity consumers paid FirstEnergy $6.9 billion to compensate the company for generation assets “stranded” when its monopoly over energy sales was eliminated in 1999. Now, FE is asking them to pay again to prop up nuclear and coal generating plants the company says are at risk of closing due to low energy and capacity prices. While the economics of the proposal aren’t convincing to consumer advocates and environmentalists, the company seems to be betting on its appeal to state lawmakers eager to save the plants’ jobs and tax revenues. Under a proposal dubbed “Powering Ohio’s Progress,” the company asked the state Public Utility Commission last week to order three of its regulated utilities to sign 15-year purchase-power agreements with the Davis-Besse nuclear plant, the mammoth coal-fired W.H. Sammis plant and two Ohio Valley Electric Corp. (OVEC) units — located in Gallipolis, Ohio, and Madison, Ind. — in which it owns a 105-MW interest. In effect, FE wants distribution customers of Toledo Edison, Ohio Edison and The Illuminating Company to subsidize the plants in at least the short term in return for the potential upside in the later years. FE projects market revenue will begin exceeding costs in 2019 and continue to do so throughout the remainder of the program, saving retail customers $2 billion (nominal) or $800 million in net present value — an average of $360 (nominal) per customer — over the 15-year term. The projected savings are based on layers upon layers of assumptions, including future fuel prices, economic growth and operating expenses. Some of the assumptions, such as an ICF International projection on future electricity prices, have been redacted and cannot be inspected by the public (though the numbers will be available to Ohio PUC analysts). UBS Securities said the PPA was priced to begin at about $65/MWh — $26 above current market prices —and increase by $2/MWh annually. The proposal makes no sense to the Office of the Ohio Consumers’ Counsel. The Sierra Club also was critical. That’s not how FE sees it. Company spokesman Douglas G. Colafella said Friday that the plan is aimed, in part, at preserving the reliability of regional power grid, and protecting FE customers from weather-related price spikes. 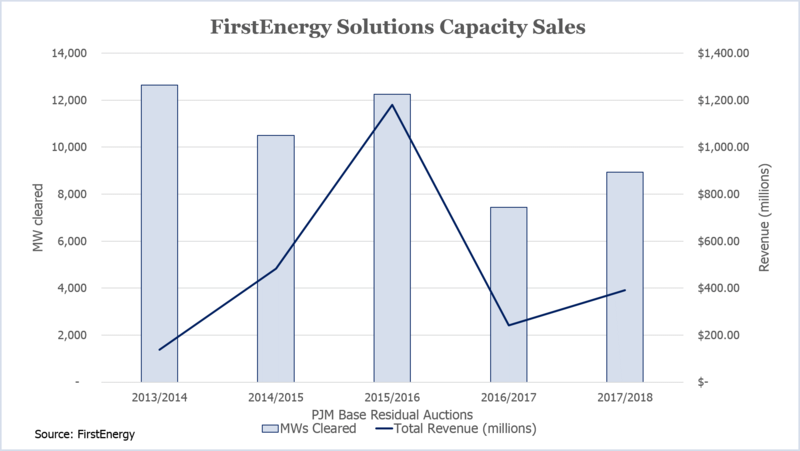 Under the plan, FE’s regulated Ohio utilities will buy the plants’ output from unregulated FirstEnergy Solutions, the power plant owners, and then sell it into PJM’s capacity, energy and ancillary services markets from June 2016 through May 2031. The regulated utilities would pay all of the plants’ expenses, including fuel, operations and maintenance, depreciation and taxes, plus a “reasonable” return on invested capital of 11.15%. The three utilities would net the revenues against costs, with the difference being passed along to customers through a “retail rate stability rider” that would act as a charge or credit on their monthly bills based on the fortunes of the plants in PJM’s markets. The utilities would freeze distribution rates, which they say have increased only 1% since 2009, through 2019. “As power prices increase as projected over time, proceeds from the market sales that exceed costs from the purchased power agreement will be applied as credits on customers’ electric bills to mitigate volatility and address rising retail prices,” FE said in a press release. The company predicts that its regulated utility customers in Ohio would pay higher prices for the first three years — about $3.50 per month for the first year — and then the market prices would increase and the surcharge would transform into a credit. None of it, however, is guaranteed. UBS analysts, who last month changed their outlook on FE from “hold” to “sell,” issued a report last week expressing skepticism that the company will win commission approval for the proposal, although a smaller, less expensive plan might pass muster. FE is portraying the plan as an attempt to save two of its largest generation assets — the 2.2-GW Sammis plant and the 908-MW Davis-Besse nuclear plant. But UBS said the company’s leverage with state officials was reduced by the disclosure that the two plants cleared PJM’s Base Residual Auction in May. In its quarterly earnings filing last week, FE reported that it cleared 8,930 MW in the capacity auction, up from 7,440 in the 2013 auction but down from the more than 10,000 MW that cleared in the prior three auctions. FE officials said that because its 2.4-GW Bruce Mansfield coal-fired plant had not cleared the auction, it would delay spending on a dewatering facility it needs to continue operation beyond the end of 2016, when the plant’s coal ash waste impoundment must close. The plant is Pennsylvania’s largest generator. The Ohio PUC has not yet set a hearing date on the 1,000-page filing; the company has requested a decision by next April. There are certain to be many eyes on the plan going forward. American Electric Power CEO Nick Akins said last week the Columbus-based energy giant is seeking only a partial “restructuring” of Ohio’s energy market, not full reregulation. FirstEnergy will retire four units at its Sammis coal-fired power plant and sell or deactivate its Bay Shore plant by 2020.